Why is Mike Ashley interested in BHS? Playing the white knight could be good PR, but there must be a business case too. It just had to happen, really. A well-known British retail brand goes under and, in the jumbled aftermath of bitter recriminations and attempts to find a new buyer, Mike Ashley gets involved. No stranger to controversy, the billionaire recently made public his firm Sport Direct’s intention to ‘save’ BHS, which fell into administration last week. It’s not the first time Ashley’s eyed BHS - he was in talks to step in just before it went under - nor is it the first time he’s been involved in department stores – Sport Direct owns a stake at Debenhams, where it operates concessions. But what could he gain from taking up what appears to be a poisoned chalice? The obvious answer is a bargain. Ashley conquered a huge chunk of the sports retail market by making shrewd deals – and BHS is going cheap. Much would depend on the department store’s vast debt (£1.3bn) and pension deficit (£571m) - as they are, it’s unlikely anyone would buy BHS. Without the debt and pension deficit, though, BHS has a few things going for it. It’s a well-known and geographically well-distributed brand. Yes, it failed to thrive in the mid-market, but it’s hard to imagine that’s where it would continue to operate under Sports Direct. After all, Ashley has built a huge and, for all its current woes, still highly successful company by targeting the discount market. 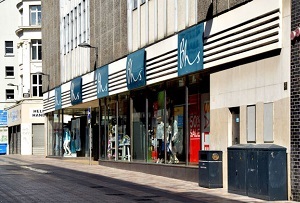 Perhaps a pile ‘em high, sell ‘em cheap version of BHS could be a real success. That’s not the approach you’d take if the sole objective was to make BHS financially solvent. When the market takes a long-term turn against you and you find yourself over-extended, you retreat – just ask Tesco or Morrisons. On the other hand, riding in as a white knight to rescue BHS and save thousands of jobs would do wonders for Sports Direct’s recent PR problems. Tales of ‘workhouse’ conditions could easily get buried in the deeper reaches of the Guardian by a good saviour story. Just imagine the photo opportunities – Mike Ashley beaming amidst BHS’s grateful employees would go down a treat (even if they were presumably now on zero-hour contracts...). This is not to say that’s the only reason Ashley’s looking at BHS, of course – there are cheaper and less risky ways of getting good PR. But if rescuing BHS provides a business opportunity and good publicity, it’s not really surprising Ashley’s interested. Should you get a celebrity endorsement?